Instagram encourages users to follow one another and “like” photos, two actions that can cause users to be seen “famous” by the community. If you’ve been striking out on the path to Instagram fame, don’t fret. You can become Instagram famous by only using the right helpful tool to boost your Instagram. Finding the right app for getting more popular account or getting more followers, it can be the best way for getting your Instagram more popular easy and fast. We did our research and we have for you one awesome app for this purpose – Rocketing for Instagram. 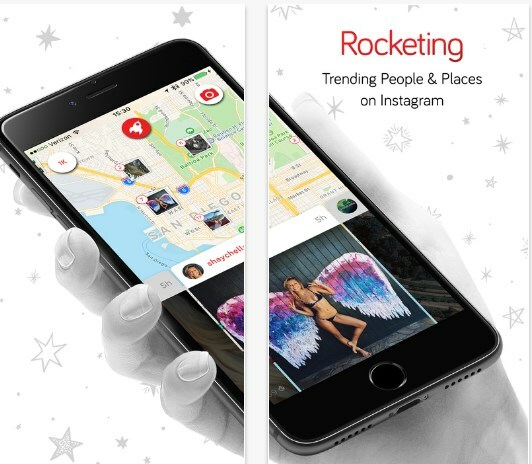 What is Rocketing for Instagram all about? Rocketing for Instagram is certainly one amazing lifestyle app for IOS users that helps them to get more entertaining Instagram experience and become more popular. The app helps the users to follow the latest trends in the worlds, people and exclusive parties. Also, the app gives the users fuel and followers for boosting the popularity of their profiles. With becoming more popular on Instagram the users can get high on leaderboards winning access to parties and different prices. This app is efficient and easy to use tool for users to get their Instagram on the next level fast and without effort. The app helps the users by giving them directly followers and helping them discover the latest trendy people and follow them. The users can instantly get to see geo-tagged photos and videos only with logging on Instagram. Also, the app boosts their Instagram with giving them Rocket Fuel for every like on their posted photo. After 24 hours, the post and the fuel burn out, giving the users access only to the most relevant posts. If the users can get on top of local leaderboards with the help of the app, the app offers them to win prices and access to exclusive parties.